Misha and Tilly invited me to their garden in the spring, not long after it had been newly landscaped by Horsham Decks and Patios. The twins, who are fairly recently famous for their TV and blogging antics, bought their house together 6 years ago. Thanks to their increased income, they’ve been able to spend money on their property and are doing a great job. The house was tackled first and they’ve managed to sympathetically extend their Victorian property, whilst opening up the rooms and letting in a lot more light. So it was natural that they should then move on to improving the garden and creating an outdoor space worthy of the entertainment business. The garden isn’t huge but it’s big enough to host a party for 50 or so guests and that’s what the Misha and Tilly enjoy. 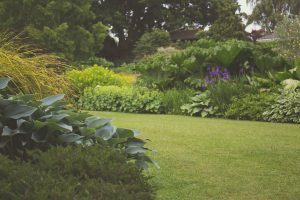 Their garden needed to be suitable for summer barbecues and wine evenings with large patio areas yet hidden depths to tempt visitors to explore the further reaches. The landscape gardeners in Horsham they chose have done a great job of interpreting the brief. There are two spacious patios, one outside the sliding rear doors and the other further down the garden, which also houses a delightful pergola and barbecue area. The whole is linked by a charming pathway constructed of Horsham stone and the girls have chosen raised beds for their planting. It’s a labour-saving way of gardening that’s becoming popular and saves knees and backs! I was impressed with the versatility of the guys who not only build patios and decking but also take care of the whole infrastructure of the garden. The garden lighting is spectacular and was done by another local firm of electricians, more about them later as I inspect another garden in West Sussex and report on the way lighting has been used to transform a garden. This particular garden has solar lighting, complemented by mains lighting to ensure there’s enough light during the winter, when we often don’t get much sun. Planting in the twin’s garden has been cleverly thought out, combining decorative vegetables with annual flowers. The results are very pretty and the whole lot is cleared out in the autumn and replanted with winter-flowering pansies to bring colour on those dismal days. In the spring the whole cycle starts again with vegetables and flowers. There isn’t much in the way of shrubs, but one beautiful old magnolia tree sits at the bottom of the garden to give perspective and must look stunning in early summer when it’s in full bloom. Unfortunately I was a little early in the year to see it at its best, but I can only imagine how it looks when covered with pink-hued blossom. Underplanting the magnolia are crocuses and miniature daffodils, which were at their best when I viewed, giving a country feel to the place. I was impressed by the enthusiasm and warmth of these two young ladies, who obviously enjoy their lifestyle and are justifiably proud of their beautiful Horsham garden. Copyright © 2019 Celebrity Gardens. Powered by WordPress. Theme: Esteem by ThemeGrill.